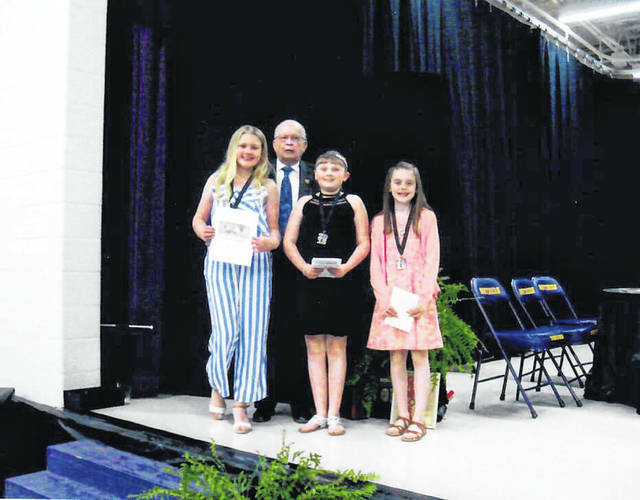 Former Sheriff, retired Southern Local Teacher and member of the Middleport-Pomeroy Rotary Club Robert Beegle presented monetary awards to Katie Brooker, Madisen Dailey and Jaylynn Hupp. The Rotary Club has been presenting awards at the banquet for over 20 years The winners are chosen by drawing names from the 4th through 8th grade honorees. In the beginning years, the students were presented a $100 US Savings Bond, but the last few years the students have been given a certificate and a $50 bill. RACINE — Southern Local School District celebrated its annual academic banquet, earlier this week, amid a large crowd in the high school gymnasium. The banquet honored 92 students ranging in grades four through twelve. The evening was emceed by Kendra White, student council reporter for Southern High School. Supt. Tony Deem gave the welcome followed by Valedictorian Sydney Cleland leading the Pledge of Allegiance. Attendees and honorees were treated to a video produced by Darren Jackson — a video starring the honorees and the great wonders of the world. The invocation was given by Salutatorian Hannah Evans. The evening’s meal was served by Southern Local’s 7-12 staff. Award presentations were made by Board of Education President Denny Evans. The banquet closed with the benediction given by Student Council President, Connor Thomas. Grade 4 — Jaylynn Hupp, Hunter Jarrell, David Kemppel, Noah Leachman, Grace Lee, Kiersten Rose, Nathan Shuster, Cole Smith, Wyatt Smith, and Bryan Venegas Mendoza. Southern Local expressed their gratitude to the families, community members, and staff members that helped make this academic banquet a success. “Congratulations to all the honorees and their families. You have something special to be proud of,” said the district. The academic planning committee consistis of Tony Deem, Daniel Otto, Tricia McNickle, Scott Wolfe, Russ Fields, Andrea Wiseman, Beth Bay, Meg Guinther, Rachel Hupp, Darren Jackson, Lori Sharp, and Vick Northup. Sponsors of the event include, Southern Elementary PTO, SLHS Band Boosters, SLHS Athletic Boosters, Carmel Sutton Church, Joyce and Tim Thoren, Southern Local Education Association, OAPSE 453, Linda Diddle, Darrell Norris and Son Greenhouses, Racine Home National Bank, Kim Romine and Forest Run Ready Mix, Peoples Bank, Farmers Bank, Bartee Photography, Kelly and Tammy Grueser, Pomeroy-Middleport Rotary Club, and Weaving Stitches. https://www.mydailysentinel.com/wp-content/uploads/sites/14/2018/05/web1_5.4-Rotary-pic20185394643940.jpgFormer Sheriff, retired Southern Local Teacher and member of the Middleport-Pomeroy Rotary Club Robert Beegle presented monetary awards to Katie Brooker, Madisen Dailey and Jaylynn Hupp. The Rotary Club has been presenting awards at the banquet for over 20 years The winners are chosen by drawing names from the 4th through 8th grade honorees. In the beginning years, the students were presented a $100 US Savings Bond, but the last few years the students have been given a certificate and a $50 bill.